Using a powerful new camera on the Hubble Space Telescope, astronomers have discovered what appears to be the most distant object ever observed, a small proto galaxy some 13.2 billion light years away that dates back to just 480 million years or so after the big bang birth of the universe. 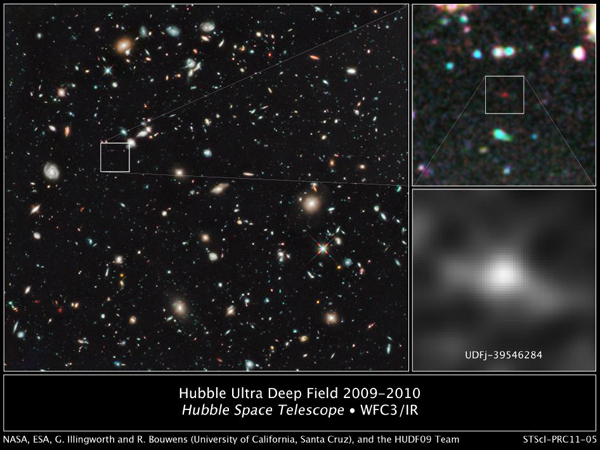 The object was found in so-called "deep field" images taken by Hubble's Wide Field Camera 3 that combined scores of optical and infrared exposures to capture a cosmic core sample showing nearby and increasingly distant galaxies. Showing up only in infrared light, the proto galaxy appears as a small, blurry smudge at the limits of Hubble's vision. But careful analysis indicates it likely is a collection of hot, young stars, a cluster 100 times smaller than Earth's Milky Way galaxy. Astronomers believe such proto galaxies combined to form the larger, more familiar galaxies seen later in the evolution of the universe. "We've gone back through 96 percent of the life of the universe, to when the universe was only 4 percent of its current age, through 500 million years after the big bang," said Garth Illingworth of the University of California at Santa Cruz. "The team searched through these wonderful data looking for galaxies at these extremely early times. We and others have found galaxies at 650 million years, quite a lot, close to 50 of those galaxies. "We thought that this new camera could teach us more about earlier times so we looked very hard at the data and managed eventually to find an object. This galaxy, 500 million years after the big bang, is extraordinarily faint, a very blue, dynamic object, full of stars forming. Not only did we find an object, we also looked at the data extremely carefully to try and estimate what the total amount of star birth was at that time. "We were astonished to find star birth at 500 million years was dramatically less than it was at 650 million years," he said. 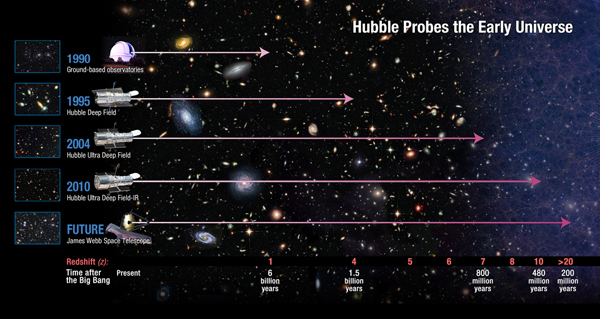 "So in a very short period in the life of the universe, star birth had increased by 10 times. Not only did this image tell us about, or show us a glimpse of a galaxy at very early times, but it also told us about how the star birth was increasing in the universe. And that has very important implications." Rachel Somerville, an astronomer at the Space Telescope Science Institute who was not part of the team that made the discovery, said "perhaps the most interesting part of this research is the dog that didn't bark." "Scientifically, it's difficult to learn that much from a single object because we don't know how typical it is," she said. "However, what this showed, which is very important, is that if the properties of galaxies and the population had remained the same as they were just 200 million years later, then they should have found at least 10 times more galaxies. That's a statistically significant result, and that means galaxies as a population were evolving very rapidly over this time period." One of the major questions in astronomy is how long it took the first stars to form in the wake of the big bang and then assemble into galaxies. The Hubble Space Telescope has played a key role in that research, taking what amounts to long time exposures, with increasingly sensitive cameras, to capture light from the early ages of the universe. Hubble's first deep field image was unveiled on Jan. 15, 1996, at a meeting of the American Astronomical Society. Hubble was aimed at an empty region of space in the northern constellation Ursa Major, imaging an area about the size of a grain of rice held at arm's length. The Wide Field and Planetary Camera 2 snapped 342 exposures over 10 days between Dec. 18 and 28, 1995. The image was a bit of a gamble given the high value of observing time on Hubble and the lack of any certainty about what the telescope might find. But the gamble paid off. The resulting image -- the original Hubble Deep Field -- astonished astronomers and the public alike, showing more than 3,000 galaxies in various stages of evolution, some of them dating back to around 1.5 billion years after the birth of the universe 13.7 billion years ago. A second deep field image was assembled three years later using a southern hemisphere target. But Hubble was not done. In 2004, the Space Telescope Science Institute unveiled the Hubble Ultra Deep Field, a 278-hour series of exposures using the Advanced Camera for Surveys and the Near Infrared Camera and Multi-Object Spectrometer, or NICMOS, that revealed an estimated 10,000 galaxies in a small area of the sky below the constellation Orion. A careful analysis showed the oldest galaxies in the image dated back to within about 800 million years of the big bang. Using the new Wide Field Planetary Camera 3, installed in the most recent Hubble servicing mission in 2009, researchers have discovered nearly 50 small proto galaxies dating to around 650 million years after the birth of the universe. The discovery announced Wednesday was based on an exhaustive review of the data collected to date. The infrared images that were combined to show the faint object amounted to a 41-hour time exposure. "We are really pushing Hubble to its limits here," Illingworth said. "We can try and get more data and look for more of these 500-million-year-old galaxies, and we should be able to find some, but we won't be able to go to earlier times." For that, astronomers must wait for the James Webb Space Telescope, an infrared observatory scheduled for launch later this decade that is optimized for studying the early universe.